Do you have questions about products, parts, or procedures pertaining to your restoration project? Why not ask Doug for a free restoration tip! 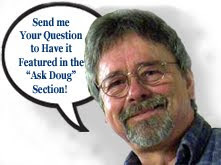 When you submit your question, please write "Ask Doug" in the subject line of your email. Please note that your questions and my answers may be published here on my blog, in the Ask Doug section. Your email address and personal information will not be published, but your first name may be used. I appreciate your patience, and I will have a reply by email as soon as possible. This is a unique free opportunity, and therefore a limited time offer, as there may be a charge for this service in the near future, so submit your Ask Doug questions now!